This year’s TYC Rangzen Award was a special one to commemorate the 2008 Rangzen Uprisings that taken place throughout Tibet, and to honor all the Tibetans who taken part in this revolutionary struggle. The award was presented to Mr Lhasang Tsering, a veteran Tibetan independence activist and former president of TYC. Lhasang Tsering la who hails from Riwoche in Eastern Tibet was educated at Wynberg Allen School, Mussoorie, and later volunteered to join the Tibetan Resistance movement in Mustang. He was the principal of the Tibetan Children’s Village School for a number of years and also served the Tibetan government in a variety of capacities. Lhasang Tsering la was president of the TYC from 1986 to 1990 during which the organization’s activism for Tibetan independence became international. Lhasang Tsering la was also one of the founding directors of Amnye Machen Instititue, Tibetan Centre for Advanced Studies, during which he and his colleagues worked to enrich the literary and intellectual life of exile Tibetan society. He himself is the author of an anthology, Tomorrow & Other Poems (2003), and last year his superb translations of the songs of the Sixth Dalai Lama, Ocean of Melody, was published by Rupa. Lhasang la still writes his poems and works to spread the message of Rangzen from his home Exile House, at McLeod Ganj. The Tibetan Youth Congress also unveiled a “Martyr’s” award, to honor those patriots who lost their lives in the 2008 unrest. 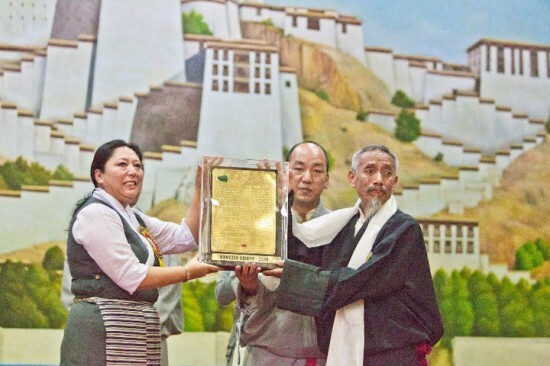 The award was received by the Gu-Chu-Sum Movement (Ex-Tibetan Political Prisoner’s Association). Much respect to Gen Lhasang Tsering la for this award. It made me very happy. true! one man army for 23 years! the last tibetan independence warrior with political brain, not spiritual cowdung in his skull! may he live another 30 years! may he lead us soon at a thousand fronts around the roof of the world! only secular bi-party democracy in exile will ensure its possibilities. tibet must be free now!